Julie L. Miller is a Licensed Marriage and Family Therapist who received her Master of Science in Family Therapy degree from Friends University. When we talked about what she would like to see on her website, she indicated that she wanted it to present not only her services as a professional therapist, but also a way for current and potential clients to contact her easily. Through her listings on several psychology websites, she is able to direct people to this website that includes a popup window for contacting Julie or seeking more information. 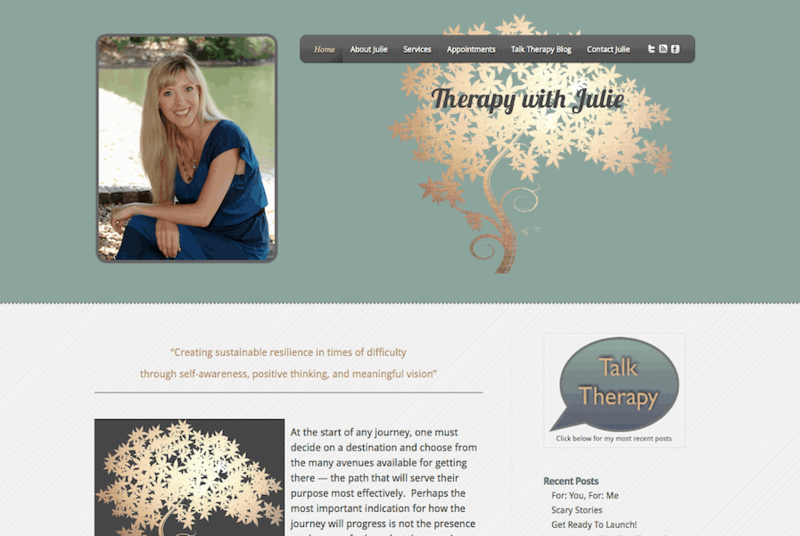 Julie also wanted her website to reflect her own personal style as well as her views and philosophies related to both therapy and life in general. Her Talk Therapy blog is personal, insightful, and varied in its themes and topics. The Therapy with Julie website blends personal and professional elements in a format that fits Julie “to a T,” with the T representing the life-changing therapy she provides for individuals, couples, and families. Visit her site at the link below.